In the heart of Jüchen, where the old Romans already stopped off, between Aachen, Mönchengladbach, Dusseldorf / Neuss and Cologne is our cozy cottage (non-smoking) in the city center of Jüchen. Our house is an old brick house from the turn of the century and with about 85 m² it offers enough space for up to 5 people. It is an ideal starting point for families or small groups for cycling, city breaks or just to relax. It consists of kitchen, living room, dining room, bathroom and 3 bedrooms (1 double, 1 twin and 1 single) with a total of 5 beds and a courtyard and a 25 m² covered terrace with garden furniture. In the decorated with attention to detail holiday home you will not miss anything. 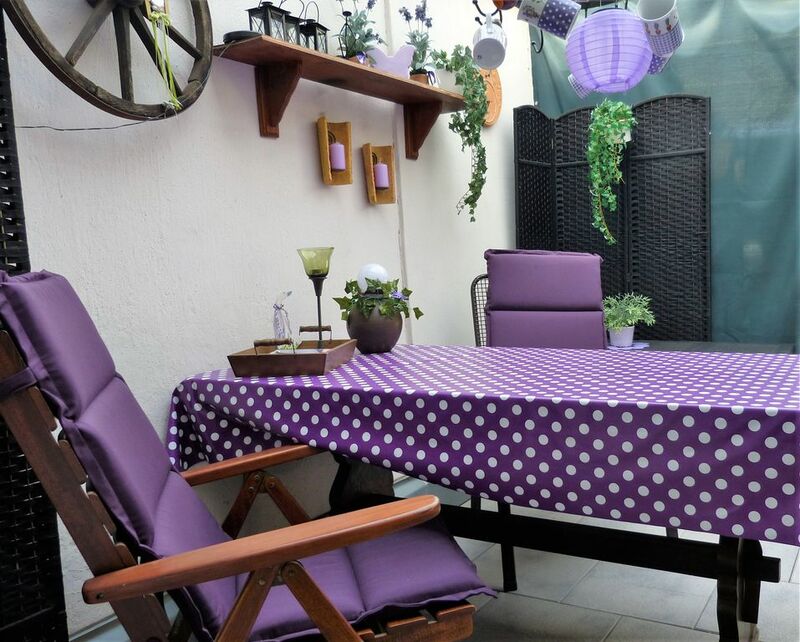 After the day's work done, our small courtyard invites you to barbecue or our terrace for a cozy evening. The price is for 2 persons / night 70,00 € and for each additional person 12,50 € and includes bed linen, towels, water, electricity, heating, W-LAN and final cleaning. Our apartment was by the General German Bicycle Club e. V. (ADFC) recognized as a cyclist friendly accommodation company and now certified with the Q I - predicate of service quality Germany. Our house is located in the city center of Jüchen. "Historic highlights" such as the house Katz, the two churches in the village, listed half-timbered houses as well as the open pit Garzweiler I are within walking distance of our house to explore. Due to our location in the city center you will find two pharmacies, doctors, bakeries, a grocery store (REWE) as well as 3 food discounters (Aldi, Lidl and Netto) in the immediate vicinity. Directly at the house there is the possibility of loading and unloading your car. Long stops or parking hinders the flow of traffic and makes the city happy (nodules). A sufficient park offer can be found at the house Katz, about 2 minutes walk from our house. In cooperation with the youth welfare office of the Rhein-Kreis Neuss and the cycling friends Jüchen as well as the ADFC Jüchen the city developed a folding map with interesting bicycle routes. There are 27 stations that can be reached by bike to linger, romp and visit. Named routes are ideal for cycling and include a variety of interesting playgrounds and numerous attractions. All tips are of course free of charge and thus promote a purse-friendly, family and nature-friendly leisure activities. The added family rally also gives reason for a great family outing. You will receive the latest family leisure tips at the information desk in the city hall of Jüchen. Haus Katz is a listed building in the heart of the Jüchen city center. The building was once the office of the duke of Jülich (Paulus von Katz), which gave it its name, mainly as an administrative seat. Today, the building, built around 1706, is the council hall of the city of Jüchen, exhibition space and meeting place. Also here is the registry office of the city. Popular with its location, which also includes the secluded courtyard, it invites bride and groom from near and far to a civil wedding in a romantic atmosphere. As a moated castle with several fortresses and its important English landscape garden, Schloss Dyck belongs to the important cultural monuments in the Rhineland. As a center for garden art and landscape culture, today it offers a multifaceted offer to families and visitors interested in culture as well as to garden lovers and professionals. Nikolauskloster, an oasis in the Rhine circle Neuss. Eight Oblate missionaries live and work here to spread the Gospel to all. The Oblates of the Immaculate Virgin Mary are a missionary congregation of the Catholic Church and celebrated their 200th birthday in 2016. In the Nikolauskloster they are already 111 years. Three-quarters of German lignite comes from the Rhineland district in the city triangle between Aachen, Cologne and Mönchengladbach. Here, up to 100 million tons of lignite are mined annually in the three opencast mines Garzweiler, Hambach and Inden. RWE has set up lookouts at these locations. They offer a fascinating insight into the broad spectrum of lignite mining.